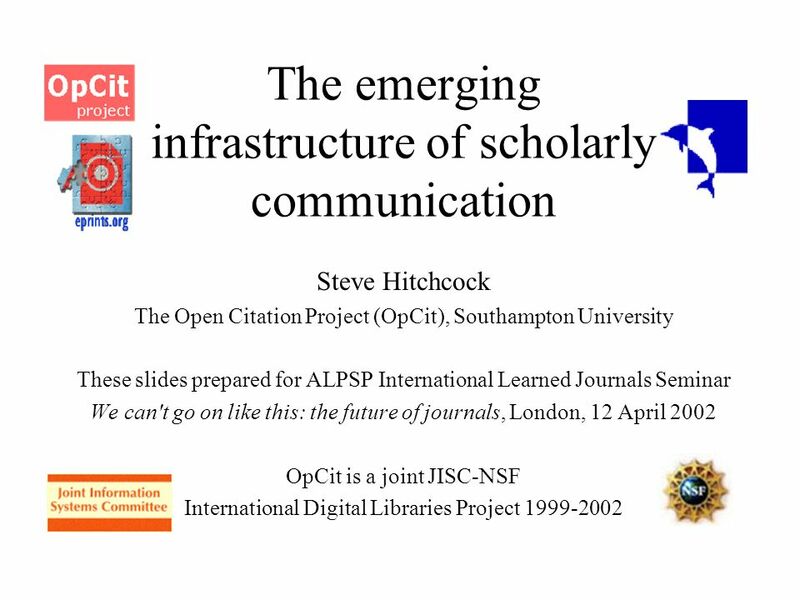 The emerging infrastructure of scholarly communication Steve Hitchcock The Open Citation Project (OpCit), Southampton University These slides prepared. 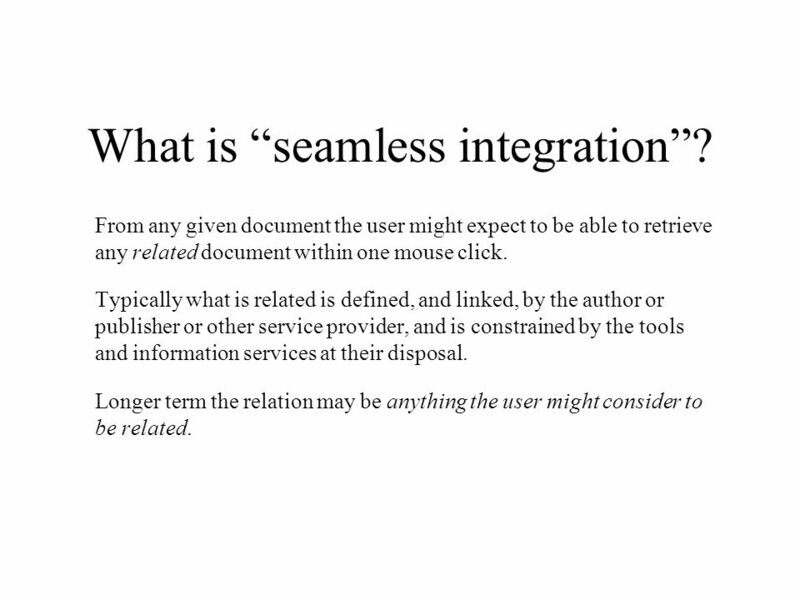 4 What is seamless integration? From any given document the user might expect to be able to retrieve any related document within one mouse click. Typically what is related is defined, and linked, by the author or publisher or other service provider, and is constrained by the tools and information services at their disposal. Longer term the relation may be anything the user might consider to be related. 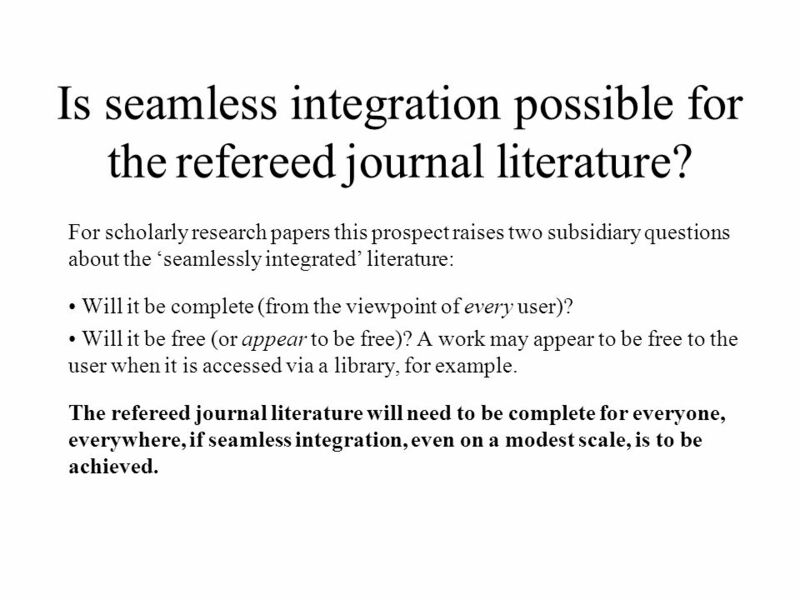 6 Is seamless integration possible for the refereed journal literature? 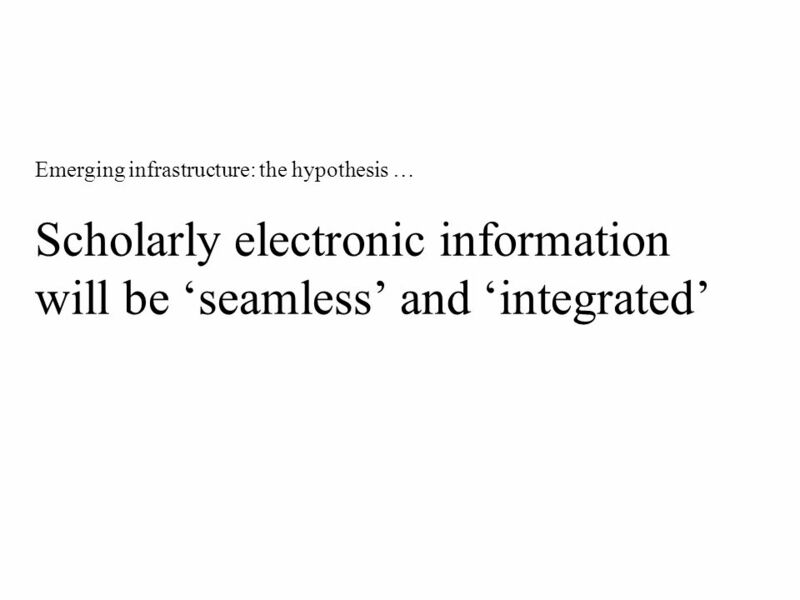 For scholarly research papers this prospect raises two subsidiary questions about the seamlessly integrated literature: Will it be complete (from the viewpoint of every user)? Will it be free (or appear to be free)? A work may appear to be free to the user when it is accessed via a library, for example. The refereed journal literature will need to be complete for everyone, everywhere, if seamless integration, even on a modest scale, is to be achieved. 8 Making appropriate connections Library users may have authority to access a paper via one library subscription or another, directly from the publisher or via an aggregator or other agency. This has become know as the appropriate copy problem. OpenURL is a generalized framework for communicating and resolving links and supports software solutions to the appropriate copy problem. 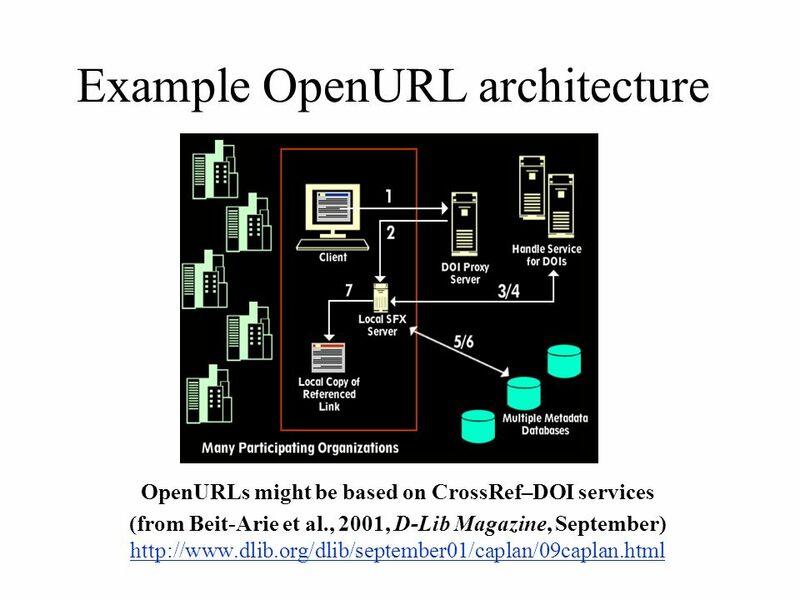 OpenURL is described as an interoperability specification. 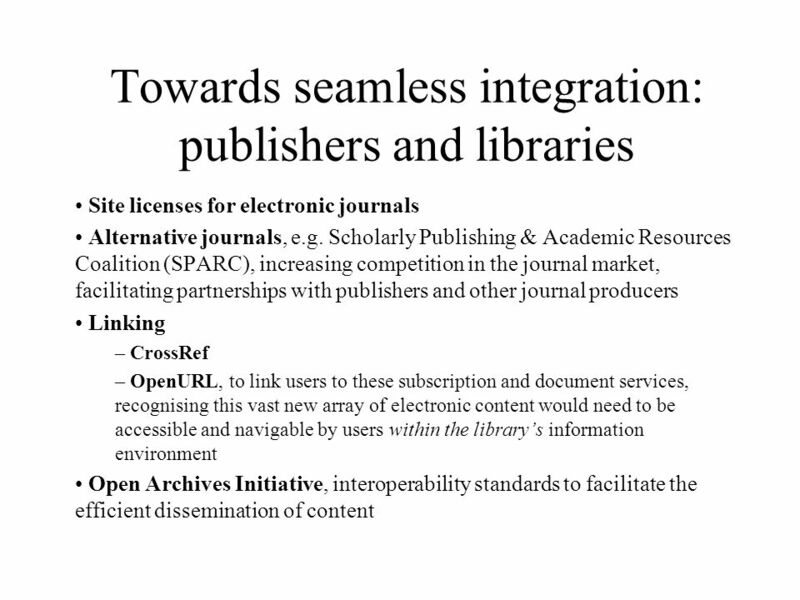 11 The Open Archives Initiative (OAI) The OAI (http://www.openarchives.org/) defineshttp://www.openarchives.org/ A Metadata Harvesting Protocol (MHP), an application-independent interoperability framework that can be used by a variety of communities engaged in publishing content on the Web Two classes of participants –Data providers expose metadata about content –Service providers issue protocol requests to data providers c.f. 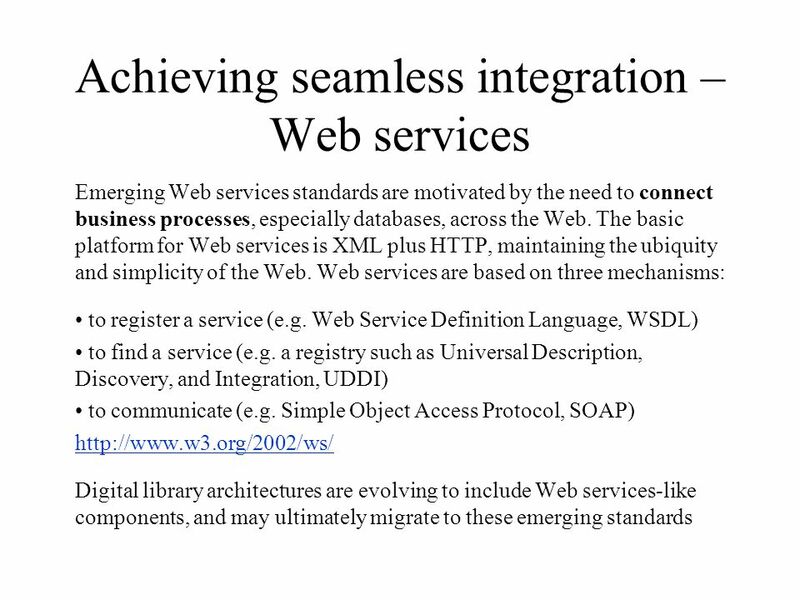 Web services: register, find, communicate, mediated by XML and HTTP OAI is a very simple, low-barrier-to-entry interface, shifting implementation complexity and operational processing load away from the data repositories to the developers of federated search services, repository redistribution services, etc. 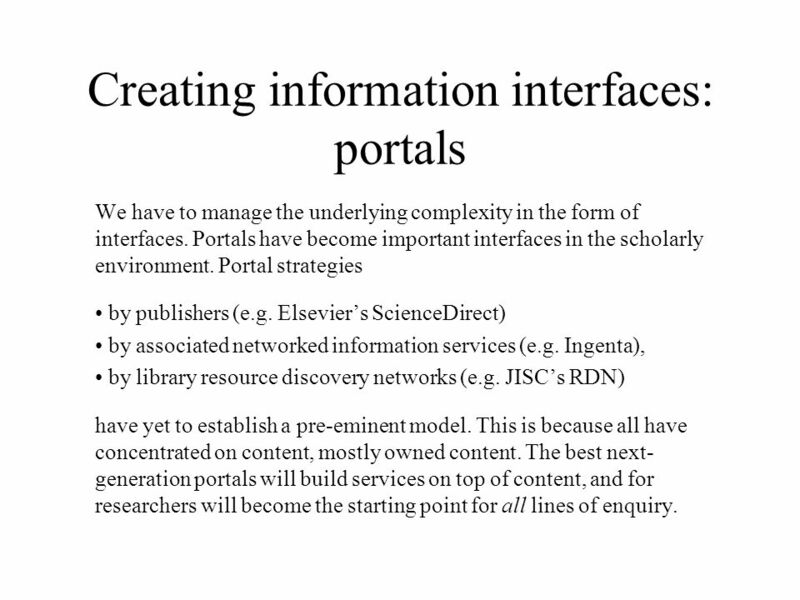 12 Creating information interfaces: portals We have to manage the underlying complexity in the form of interfaces. Portals have become important interfaces in the scholarly environment. Portal strategies by publishers (e.g. 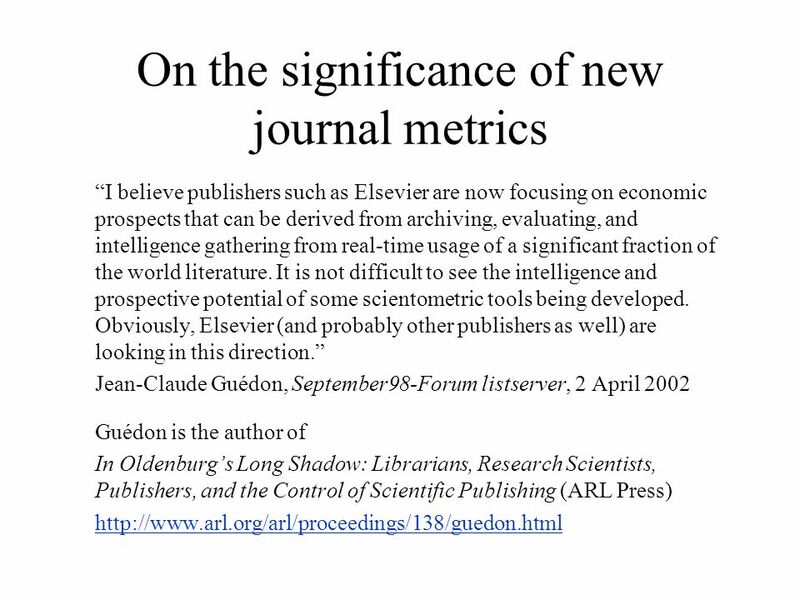 Elseviers ScienceDirect) by associated networked information services (e.g. Ingenta), by library resource discovery networks (e.g. JISCs RDN) have yet to establish a pre-eminent model. This is because all have concentrated on content, mostly owned content. The best next- generation portals will build services on top of content, and for researchers will become the starting point for all lines of enquiry. 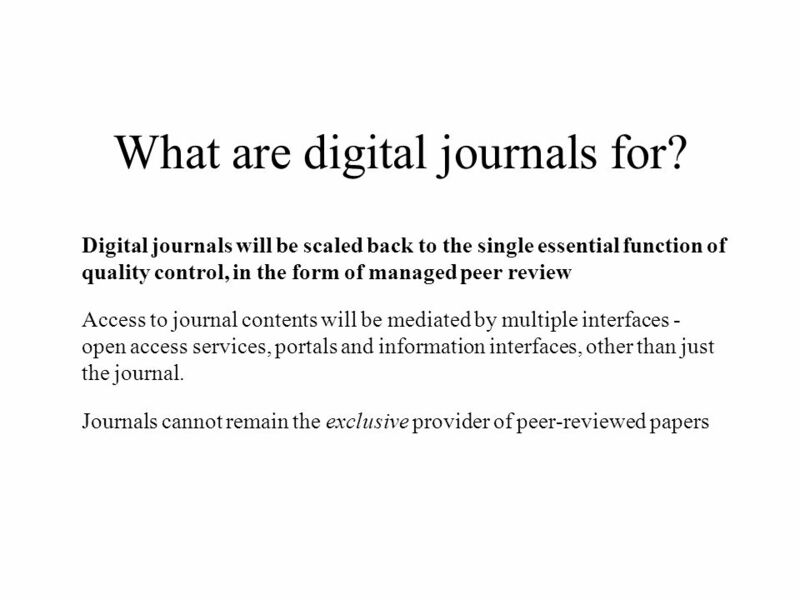 13 Access and interfaces: implications for journals Digital information, rich in media and resources, formal and informal, mediated by multiple services, presents the user with an array of choices that might answer his or her queries most efficiently. Those queries might be expressed as input to a search engine, or by selecting a link. 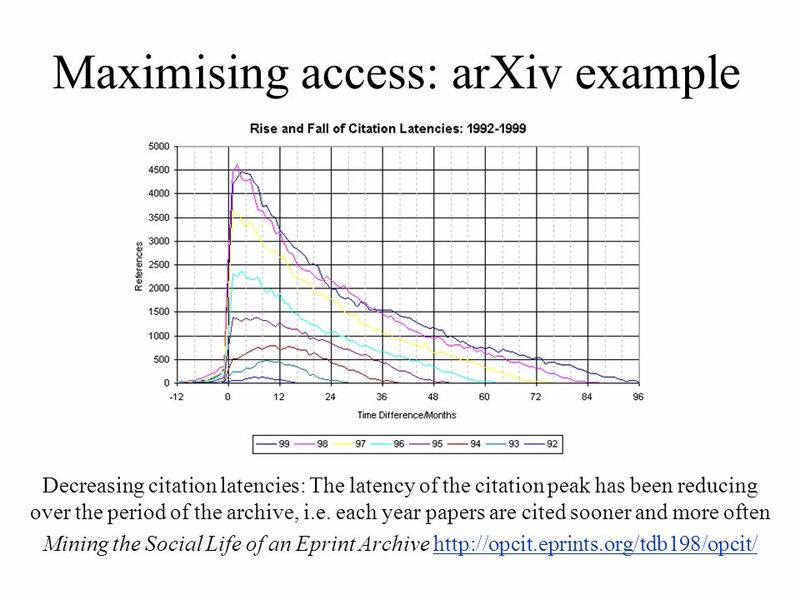 Where might these citations come from? Personal emails, discussion lists, open access services such as OAI, eprint archives, newsletters, library services, Z-gateways and academic subject portals, as well as formal research papers and commercial indexing services. There will be many more. The journal package has traditionally been bound in issues and volumes. 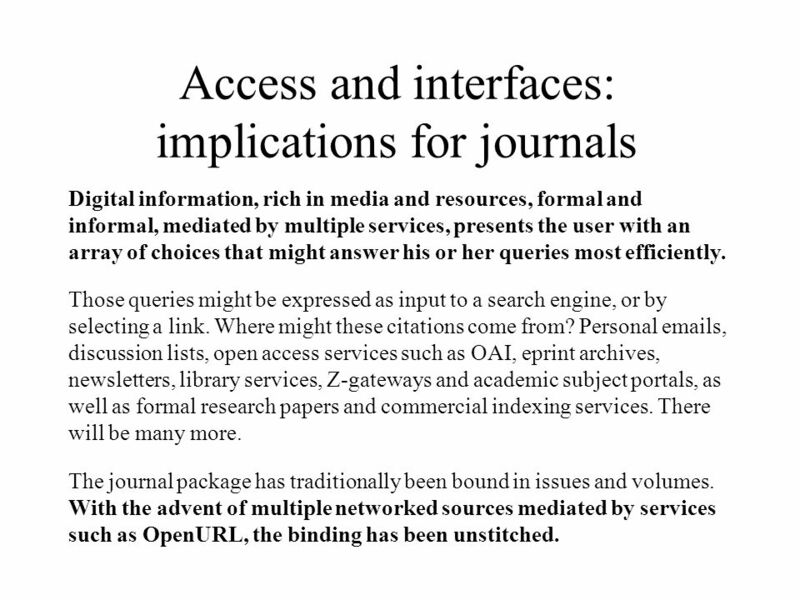 With the advent of multiple networked sources mediated by services such as OpenURL, the binding has been unstitched. 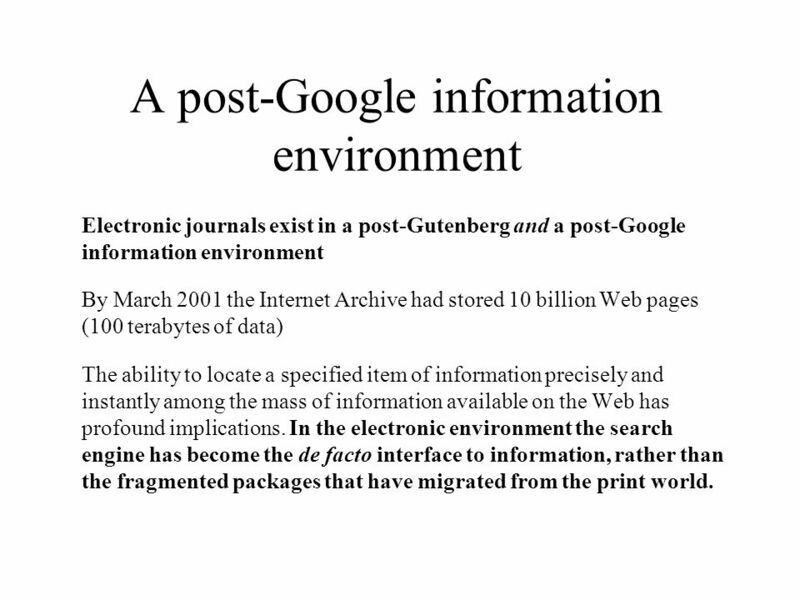 15 A post-Google information environment Electronic journals exist in a post-Gutenberg and a post-Google information environment By March 2001 the Internet Archive had stored 10 billion Web pages (100 terabytes of data) The ability to locate a specified item of information precisely and instantly among the mass of information available on the Web has profound implications. In the electronic environment the search engine has become the de facto interface to information, rather than the fragmented packages that have migrated from the print world. 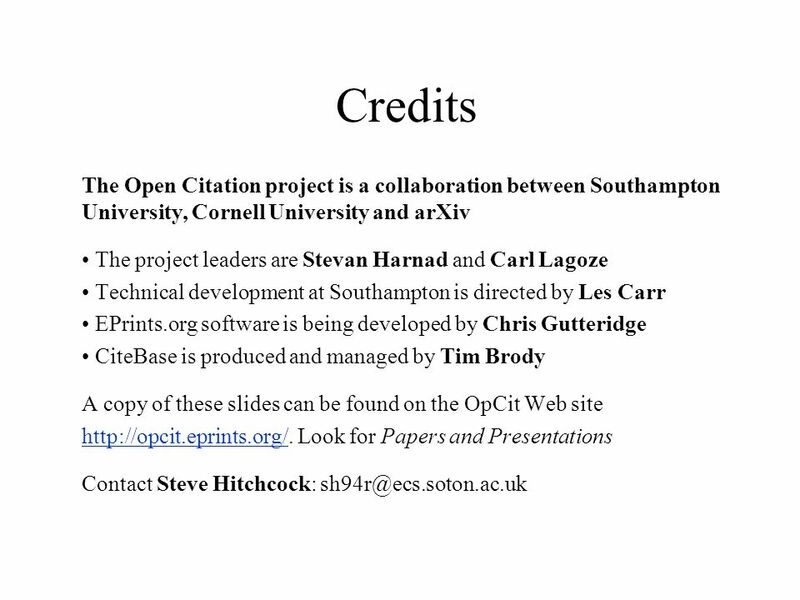 Download ppt "The emerging infrastructure of scholarly communication Steve Hitchcock The Open Citation Project (OpCit), Southampton University These slides prepared." Richard Jones, Systems Developer Technical Issues for Repository Software Theses Alive! Edinburgh University Library SHERPA Nottingham. OAI from 50,000 Feet OAI develops and promotes interoperability solutions that aim to facilitate the efficient dissemination of content. Begun in 1999. LOCALIZED REFERENCE LINKING PROJECT Dale Flecker NFAIS/NISO Linking Workshop February 24, 2002 Philadelphia. The Emerging Framework for Scholarly Communication Steve Hitchcock The Open Citation Project (OpCit), Southampton University These slides prepared for. 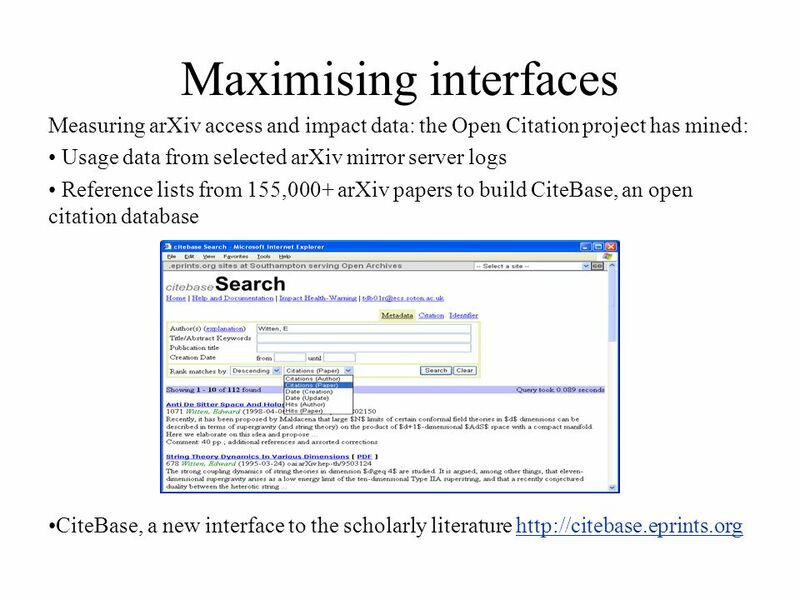 A brief overview of the Open Archives Initiative and OpenURL Steve Hitchcock Open Citation Project (OpCit) Southampton University Prepared for Z39.50/OAI/OpenURL. Southampton University Research e-Prints: e-Prints Soton School of Medicine Discussion 19 Jan 2005 Pauline Simpson Elizabeth. Tim Brody University of Southampton CiteBase Services 13/07/2001. Open Access for authors, researchers and their institutions Presented by Steve Hitchcock, School of Electronics and Computer Science (ECS), Southampton. 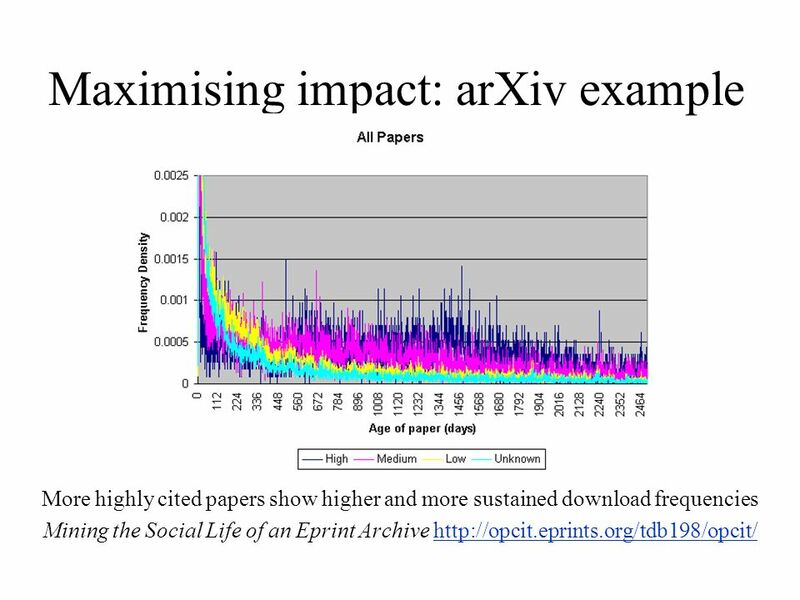 Eprints - What's in it for the Researcher? Presented by Steve Hitchcock, School of Electronics and Computer Science (ECS), Southampton University These. 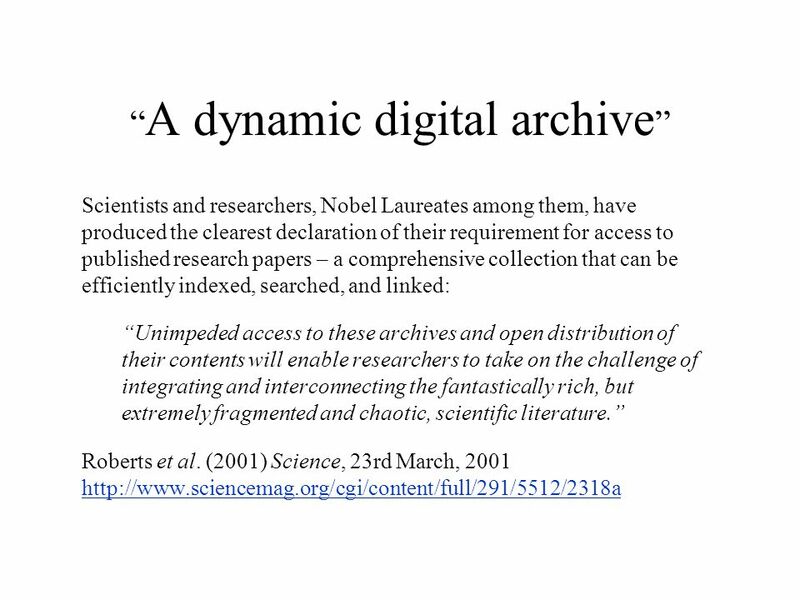 Revealing a New Dynamic: Interaction in an Open Access Archive Steve Hitchcock The Open Citation Project (OpCit), Southampton University These slides prepared. IST Humboldt-University, Berlin, Germany - Electronic Publishing Group - Computing Centre / University Library Susanne Dobratz, 28. March. Open Archives Forum IST Leona Carpenter UKOLN, University of Bath UKOLN is funded by Resource: The Council.